Where Can I get drivers for my Radeon Series Graphics card? Using an older driver package can result in instability and crashing, downloading the latest driver is recommended. Why do I only get a black screen at boot and no video signal to my monitor? Generally your graphics card should auto detect the device that is connected to the monitor however in some cases it might still be defaulted to your integrated graphics card which is the motherboards video output. If you were previously using an integrated video device on the computer, connect the monitor cable back to the port that you used to connect to on your motherboard. 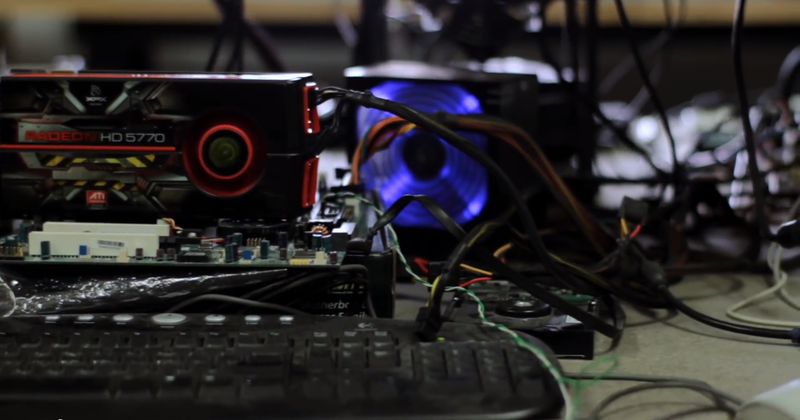 Boot up into the motherboard's BIOS settings, consulting your motherboard's documentation if necessary, to disable the integrated video card, save the settings, and then reboot with the monitor cable connected to your new video card. If that doesn't work, try swapping out your system RAM and running each stick one slot at a time and one stick at a time. Also, make sure that the power supply meets the minimum requirements of the video card. More important than the wattage will be how many Amps are available on the 12v power rail of the power supply. You can check this on the power supply unit itself by removing the side of the case. The label on the power supply will list the 3v, 5v, and 12v power rails. Add up the number of Amps listed next to any 12v rails listed and make sure that the total is greater than or equal to the minimum required listed on the side of your product box. If you are using two or more graphics cards, only one of the graphics cards may be assigned as the primary graphics card which the system will default to. If this is the case, you will need to try different ports on either card to see if it is detected. Generally, the PCI slot closest to the CPU is the primary, however previous settings may have changed that so check your settings both in your BIOS and driver utility software to see what your current configuration is. Does water-cooling or installing a third party cooling solution on my video card void the warranty? For VEGA class products, it is recommended not to touch the cooling solution or thermal paste, the VEGA GPU and HBM memory are very sensitive and can be easily damaged compared to previous GPUs. For non-VEGA products, installing third party cooling solutions does not void warranty. Just be sure to keep the original cooling solution as it will have to be on the card if it is ever sent in for RMA. Products returned to XFX must be fully assembled with the original thermal solution (heatsink, fansink, etc) that was installed at the time of purchase. XFX graphics card were designed to perform optimally with our manufacturers thermal solutions, however you may feel the need to push your performance higher than what we have designed it for, so we can only gurantee the performance and quality of the product as it was originally intended so you should keep in mind that over clocking your graphics card and the use of water cooling solutions is at your own risk and that damage to the card via improper use such as unregulated power overages will not be covered. Any physical damage such as burn marks or damaged PCB will void ALL warranties. This modder friendly policy only applies to the United States and Canada. Why does the PCIe power adapter have two plugs at the end that plugs into the power supply? Most newer power supplies now come with a dedicated 6 pin PCIe power connecter. 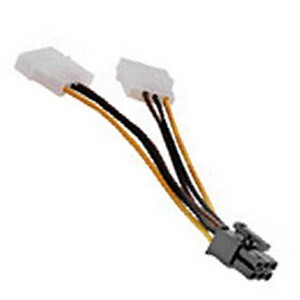 If your power supply does not have one you must use the PCIe power adapter (shown below) and connect both 4 pin molex power connections to your power supply. This will ensure a reliable flow of power to your graphics card and help stability. Why does my XFX graphics card run hot? Video card temperatures typically range from 40C to 80C. Most high end video cards such as the Radeon 6000, 7000 and R Series typically display temperatures 50-70C idle and up to 80C-90C at load. The latest 7000 series cards run hotter than most and can reach a maximum of 105C. The heat sink and fan assemblies attached to the video cards are specifically designed to reduce temperatures as much as possible. If you are having trouble with heat we recommend turning your fan speed up to 100% your AMD Catalyst software under the Overdrive section where you can tune your graphics card or you can adjust your voltage and clock speeds to find the optimal performance to heat ratio. Does overclocking void my warranty? Overclocking our products does not void the warranty as long as there is no physical damage to the product or missing components. However XFX Support will not be able to assist you in overclocking the product. Please remember, other product warranties maybe voided by overclocking other products in the computer, such as your processor. This modder friendly policy applies only the United States and Canada. Do I have to uninstall my NVIDIA drivers if I'm replacing it with a new Radeon Graphics card? It is generally recommended that you remove existing NVIDIA software and drivers because they share some applications that may have conflicts such as the Direct X drivers. We strongly recommend that you uninstall the previous video card drivers before installation of any new ones. This is done through the "Add/Remove Programs" menu in the control panel, also known as "Programs and Features" in Vista/Win7. You will need to remove the Nvidia display drivers and physx. One at a time, click on the application and then choose remove from the button at the top of the window. Wait for each process to complete before beginning the removal of the next application. What is the warranty on my XFX Video Card? In United States and Canada, XFX has the strongest warranty in the Video card industry. All video cards get at least a 2 year, no hassle warranty, right out of the box based on the purchase date of your reciept/invoice. Products that are Radeon R 200 Series Double Dissipation (DD- Dual Fan) can get a lifetime warranty if registered within 30 days of purchase. And this isn’t just a lifetime warranty that’s conveniently fine printed “lifetime of the product” or similar; but for the lifetime of the original owner. The wording might seem morbid, but if you purchased the card, and you’re alive, it’s covered under warranty; just keep a record of the purchase. Like to mod your video card? We got you covered there as well. We fully cover you using your own cooler and overclocking, as long as the card can be returned to stock condition it’s covered! There are restrictions however. If you do something to the card that can’t be easily undone you’re probably going to void your warranty; so please keep those soldering irons, dremmel tools, and glues/epoxies off of your graphics card. Have an older card? Don’t worry, while our warranty has changed over the years whatever warranty your card had when it was purchased it still has that same warranty! If you are experiencing any issues with previous warranties or registration, please contact us, we will deal with those issues on a case by case basis. Dont forget, since the start of the 7000 Series, Lifetime warranties cannot be transferred when selling to a 2nd party. Some other terms and conditions may apply, so please check out our full warranty terms and conditions here: http://xfxforce.com/en-us/support/xfx-warranty . If you have any questions, please contact our support staff at www.xfxsupport.com.